Do you have a vision for your windows that traditional styles can’t match? Renewal by Andersen of St. Louis offers a wide selection of specialty window styles. We’ll custom fit any of our specialty window styles to your home, taking into consideration your sense of style, your budget, and the spatial constraints of your home. Renewal by Andersen produces a wide variety of specialty window shapes and sizes in order to offer homeowners the choice to truly customize the aesthetics of their window projects. At Renewal by Andersen of St. Louis, we are often called upon to install specialty window alongside one or more traditional window styles in order to create interesting and eye-catching new features. Our design team is more than happy to work with you to design such features in order to make your home stick out. Each specialty window that Renewal by Andersen manufactures utilizes the same advanced frame and window materials as their traditional windows. This means that you won’t have to sacrifice energy efficiency or durability in order to gain a unique aesthetic. 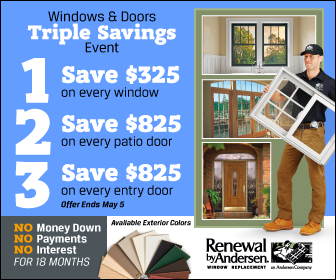 No matter what style of window you choose, be sure to choose it from Renewal by Andersen. Not only does Renewal by Andersen produce the highest quality windows on the market, but they also back each one with the deepest warranties in the industry. For full details on these warranties, visit our Window Warranties page. To learn more about our specialty window styles, give us a call or fill out our Request an Estimate form to schedule a FREE in-home consultation with the leading experts on replacement windows in St. Louis- Renewal by Andersen of St. Louis.